Light and dark is an essential element of dramatic drawing. Go into a room at night and turn the light off, then turn the light on ... lighting gives form and definition to everything you see. #1: There is just a suggestion of a sleeve bathed in light. This absence of detail heightens the impact of the composition's contrast. It suggests this side of the figure is bathed in light. 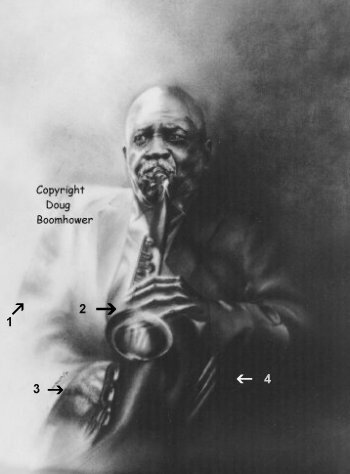 #2: The hand and the bell of the saxophone have been drawn so they look slightly "out of focus". This implies movement, and creates interest. This area has been drawn with a 3B charcoal pencil and watercolor brushes. Note the highlight on the bell of the saxophone. #3: Same technique as in #2 above. #4: These three carefully placed highlights were done with a kneaded eraser. Note the impact of such subtle highlights. They provide interest and help create depth. 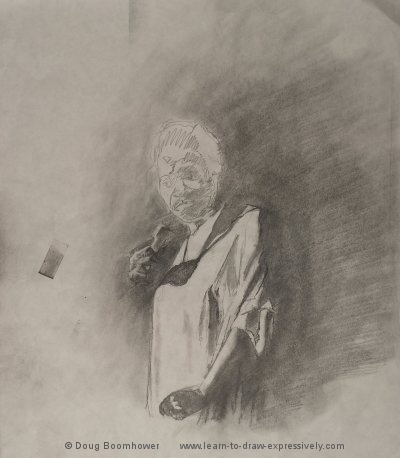 Note that the right side of the body is "peeking" through the shadows. This adds a great deal to creating interest and drama. Shadowed areas like this elicit viewer participation. The viewer has to seek out those hidden elements and complete the image on his or her own. This is a testament to the power of suggestion...something I use a lot in my work. 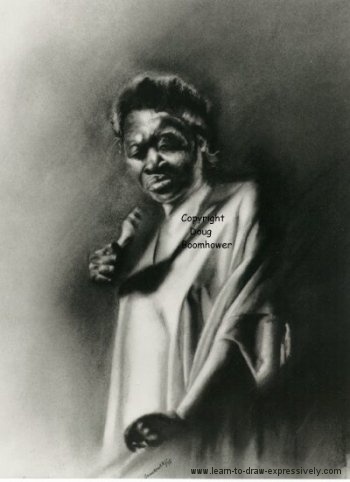 This enlargement allows you to get a clear idea of the expression in the musician's face. Note the intensity in the eyes and the furrowed brow. #1 indicates a vein. This subtle but important detail implies that the musician is aggressively blowing his saxophone. 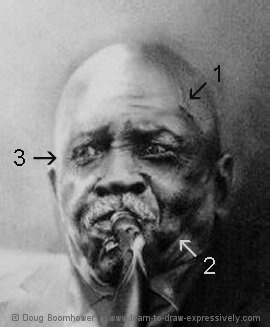 #2 The cheek is bulged out to emphasize the act of blowing the horn. #3 The details in the eye on the left are subtley melting into the light. Using water color brushes, I very gradually eliminate detail. All of this close attention to detail adds up to drawing expressively. 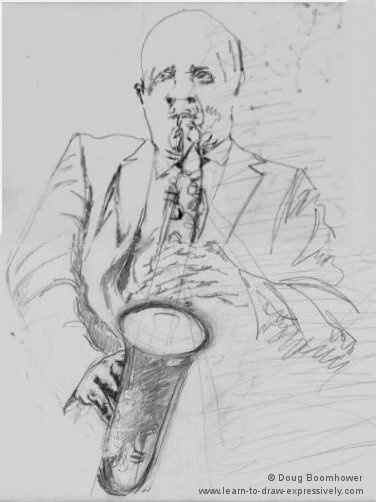 One of the preliminary studies I did to determine the layout of the piece, and the gesture of the musician's movement. As you can see, the face was not a prime concern in this preliminary. It was dealt with in a different drawing. The power of the piece comes from the use of light and dark. How real her hair looks with only the appropriately placed highlights. The shadow of the microphone and the hand across her dress. This creates depth and interest. Neither hand is detailed, yet they are powerful because of the lighting. Note the whisp of hair behind her ear. Subtle details like this have a lot of impact. Her left hand almost looks abstract because it's hidden in shadow, yet you can tell she's snapping her fingers. Intricate shadows fall across her face. The right side of her melts dramatically into the background. The front of the dress is highlighted, but it is done more simply to contrast with the rest of the composition. 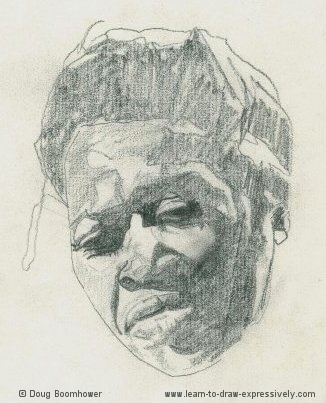 This is a preliminary pencil drawing I did of Esther Philips' head, in order to establish the light and dark tones, and of course, to establish her likeness. I enlarged it to give you a clear idea of the process involved. (The original of course, was larger). This was all done with 2B and 3B Staedtler pencils. After I did the preliminary drawing of the head, the next step was to establish the compositional layout. I experimented using light and dark, and using different shadows until I reached a composition I was satisfied with. This also is done in pencil. Once again the power of this piece comes from light and dark. I particularly liked this image. Directly below you'll see another version of the same image drawn three years earlier. You may find it interesting to compare the two. You'll notice some differences. There are things I like about each one. The jacket in the 1994 image looks more natural. The hands are moving to the point where they almost look abstract. They are reflected in the piano. To make things interesting, I gave more definition to the reflections than to the hands themselves. The reflections were done with very fine charcoal (vine charcoal) and a 3B charcoal pencil, and brushes. The reflections are mirror images of the hands. 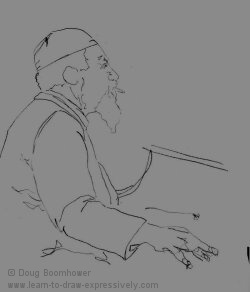 Thelonious Monk, drawn in 1991. 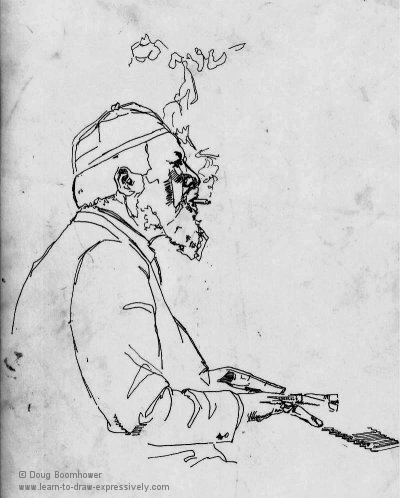 Note in both the earlier and the later images, the cigarette smoke plays an important role. It creates interest and contrasts against the black background. Also in both images, the cigarette creates an interesting highlight, as does the strong highlight on the top of the musician's leather cap. Although these details are small, they emphasize the power of light and dark. Note the intricate interplay of highlights on the face. You can even see the tight curls in the musician's hair. An obvious difference between the two images are the hands. 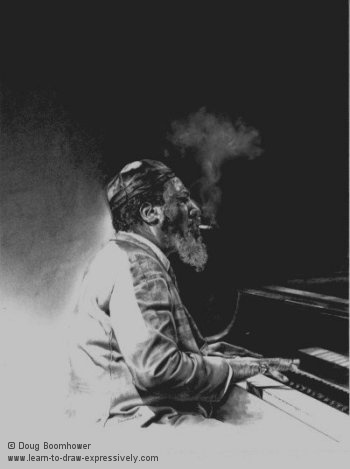 In this earlier piece, the hands are not reflected in the piano. Instead, I chose to reflect the ivories of the keyboard. As you see in the enlarged view above, the hand is moving. Its far more defined than the hands in my later drawing. Note the shadow below the hand. It serves four purposes. It creates an interesting contrast against the white of the piano keys. It draws attention to the musician's hand. It adds depth to the composition. It defines the shape of the keyboard. 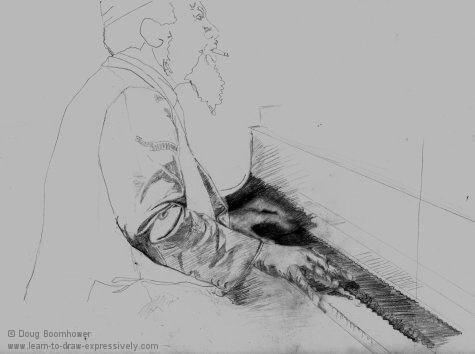 This is an initial ink drawing I did for my 1991 portrait of Thelonious Monk (as above). 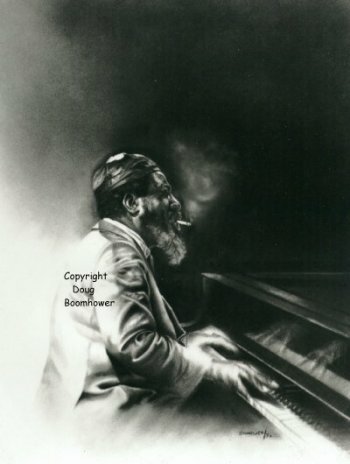 This is a pencil sketch I did in preparation for my 1994 portrait of Thelonious Monk. The most noticeable change between my 1991 and my 1994 image is in the area of the hands. This is an elaboration of the above image. Using pencil, I was experimenting with light and dark, on the hands and the jacket. 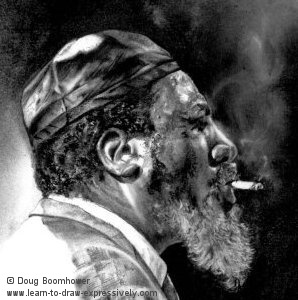 This study was a preparation for my final charcoal drawing. I wanted to imply movement in the hands. You'll even notice shadows cast across the keyboard, from the fingers on his right hand.